It’s ten years today since Gareth and I got married in Las Vegas. So much has changed. Back then we had to take selfies with our ARMS. No selfie sticks, kids. Times were tough. One of the reasons I was excited to get hitched was because I was marrying into a Nokia 6230. This state of the art phone had a coloured screen and could take 640 x 480 pixel photos! And you could send photographs by email! I had the bright idea of “live blogging” the day via a convoluted process of sending pictures to my Flickr account, which in turn zapped them to the blog by way of a bunch of embedded code. Except I forgot to email the establishing shot of us standing in front of the Graceland Wedding Chapel so nobody realised we were in Las Vegas and I got some concerned emails, “Why is Gareth playing slot machines on your wedding day!?”. I was a terrified, jet lagged mess the day before. We had to go down town to get a marriage licence from the court house, where dudes wandered round in orange jumpsuits and handcuffs like on Law & Order. I launched into a panicky ramble, How the hell did we get here? What the hell are we doing? This is a huge mistake! Gareth did so well to almost disguise his Hmmm you could be right there face. 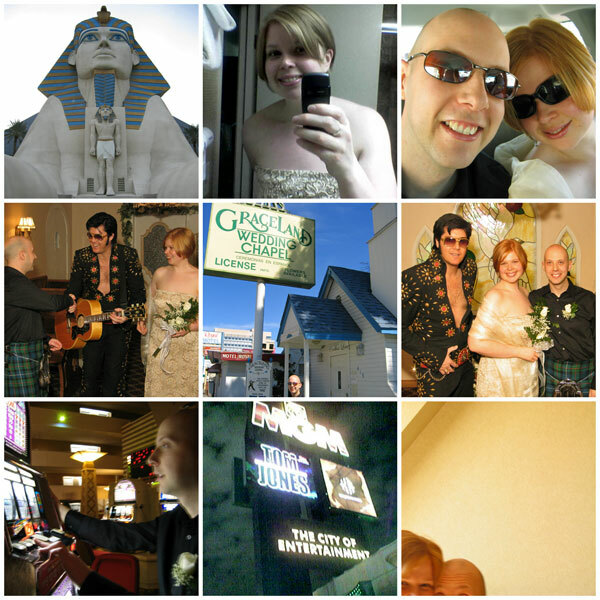 But after the ridiculous ceremony, then the second ridiculous ceremony with bonus Elvis after they forgot to film the first one, then the Pharaoh’s Pheast buffet at the Luxor, then the Tom Jones concert, it all felt good and right. There were a lot of Sham Wedding/Only Did It For The Visa jokes at the time, but it did feel unreal and shambolic. It’s hard to take things seriously with a picture of Elvis on the marriage certificate. It’s only with the testing events of the last few years that the solemnity of those vows kicked in. I’m so glad that such a ridiculous start has evolved into something strong. Well. It’s still pretty ridiculous, too. Thanks G. You still RAWK! Awww! I remember all that fancy live web stuff – it was ~amazing~. And the bonus Elvis! Has it really been 10 years? Ye gads! even longer, I think! I.nu is over ten years old and the blog that lived there was from ’99! Which may be even more terrifying! Congratulations! I have been enjoying your words and photos the whole time. Seems like a good friend! Congratulations! If I were a real-life friend, I would give you a hug. Since I’m not, I’ll do the next best thing and re-read your book. congratulations – and how amazing to share your wedding with the web! Happy anniversary! And the wedding pictures with Elvis are awesome! Now I feel kind of old! But warmly nostalgic. Here’s to you and Gareth for the next ten years! And thanks for reading for so long!!! Aww, what a coupla crazy kids you were. Congratulations, and here’s wishing you many more happy years together! Congratulations on 10 years of wedded bliss. I’ve enjoyed reading your love story, in your blog and book. And all the other topics of course. Happy anniversary! I loved reading the story of how you and Gareth met and fell in love and got married and celebrated across three continents. And I agree that those trying times really show you the value of the bond you’ve got. My hubby and I have been through some too. Awesome!!! Congrats on 10!!! Ours is next year!